Add variety to your Minecraft worlds with these new Creeper species. 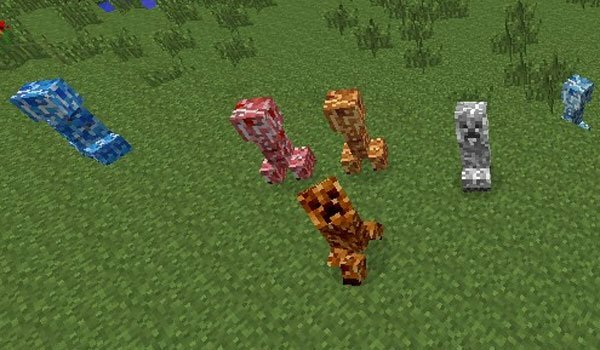 Varied Creepers 1.7.2 is a mod based on Elemental Creepers and it adds six different new ones by the moment. These are the new Creepers that you will find now on the world: Cookie Creeper, fire, ice, snow, water and dirt Creeper. Perhaps the sweetest and most sympathetic of them all is the Cookie Creeper. If you don’t have enough with the Creeper explosions, you can always try the special effects of these new creeper variants. How to install Varied Creepers Mod for Minecraft 1.7.2? New Creeper variants to animate your Minecraft worlds!